Alice loves to hear stories about when we were kids. Yesterday I told Alice about the neighborhood where I grew up. All the kids in the neighborhood would dress up as superheroes. We had Wonder Woman, Batman, Spider-Man, Electra Woman and Dinah Girl, etc... Me and my friend Amy loved the Kroft Superstars show Electra Woman and Dinah Girl. We though Dinah Girl was cute so we both played Dinah and made her little sister play the older Electra Woman :-). There is a picture of this in existence, and I will try to remember to post it later. 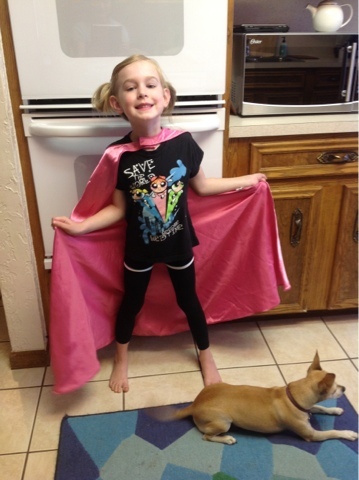 Since this story, Alice has wanted to dress up as a superhero. Alice loves the Powerpuff Girls, so we dressed her up in her PPG tee, with tights (because all super heroes wear tights), a cape and Bubbles style ponytails.